Suitable for exterior & interior use on concrete, gupsum. brick, asbestos etc. New surface must be clean, dry and free from dust, wax, salts and all unwanted material. Remove all defective and poorly adhering material of previously painted Surfaces by rubbing down using abrasive paper and dust off. For large holes and cracks. Use plaster of paris or white cement. Allow to dry. Apply 1-2 coats of Tower Wall Filling or Acrylic Primer for proper sealing from water & salts and allow to dry. Rub down the surface with abrasive paper and dust off. 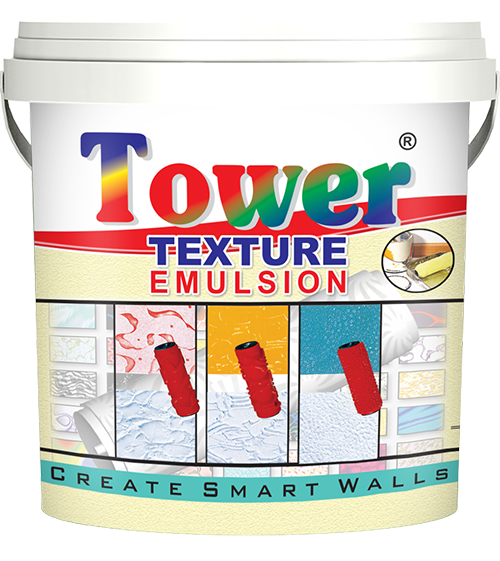 Apply Tower Texture Finish with roller. Apply designing roller to create the desired textured look.